Giving your walls a fresh coat of paint can transform the entire look of the room. If you already have wallpaper up on your walls, though, you may feel a little hesitant about painting right on top. Providing your wallpaper is in good condition you don't have to be afraid of painting, and it will save you time and money. Some wallpapers are very easy to remove. Their glue has loosened over the years and the paper peels away easily. The majority of wallpapers, however, are firmly adhered to the wall. This means that attempting to get them off could tear or damage the drywall behind them, necessitating a repair before you can begin painting. Removing wallpaper takes time. It can also cost a lot of money with the rental of steam equipment, or the need for a professional to patch the drywall once you are done. Painting over the wallpaper means you can paint right away, with your walls in their current condition. 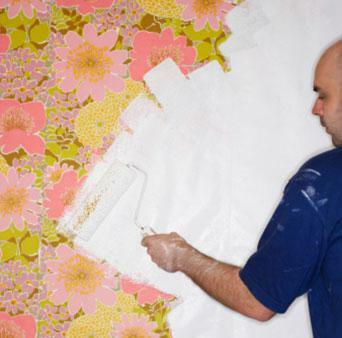 You can paint over any wallpaper, including textured, provided it is in good condition before you begin. Wallpaper can handle paint right on top of it, but only if it is in good condition. Before you take paint to paper, take some time to examine and repair the paper if necessary. Look for any loose or peeling sections of paper. Try inserting a putty knife beneath a seam in the paper to see if the paper is loose. Peel back any loose sections of paper and apply additional adhesive beneath them. Give the new adhesive time to dry so the paper is well adhered to the wall and will not delaminate once the paint is on top. The bulk of the difference in painting over wallpaper versus painting directly on drywall is in the preparation. You will need to take steps to give your wallpaper the protection it needs to avoid being pulled away from the wall by the moisture in the paint. Run a bead of caulk around the perimeter of each papered wall. The idea is to seal in the edges of the wallpaper so no moisture can seep beneath the paper and peel it and the paint away. 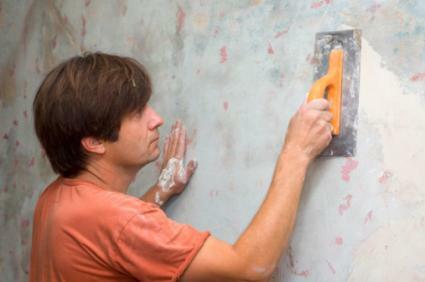 Repair any holes in the wall with spackle and sand down the edges of the repair once it is dry. Even out the texture on flocked, embossed or textured wallpaper by applying a coat of spackle to the paper with a trowel. Smooth the spackle down in one direction with the edge of the trowel to create a smooth, flat surface for the paint. Allow the spackle to dry completely. Sand down the seams in the wallpaper with sandpaper until they are less noticeable. Any bump or texture in the paper will show through the paint, so smooth out the high areas as much as you can. Tape off the ceiling, baseboards and wood trim in the room. Apply a coat of oil-based primer onto the wallpaper (If you live in California, use a urethane-based primer). Allow the primer to dry completely. 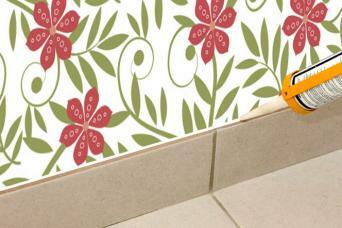 Apply your desired color paint to the wallpaper. 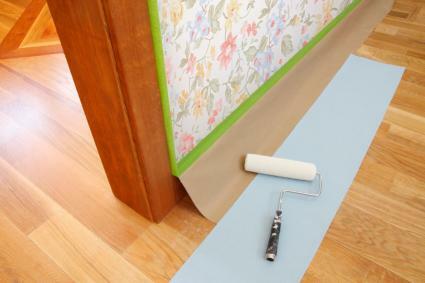 Make sure to use an oil-based or urethane-based paint, rather than a water or latex-based paint, because the water may seep beneath the wallpaper and dissolve the adhesive, causing it to peel away from the wall. Once you've applied a coat of primer to your wallpaper, you can now use any painting technique, including faux-painting tricks to give your walls an entirely new look. Once you have your wallpaper painted, you can treat it like any other painted wall in your home. Keep in mind, however, that each layer of paint will thicken the existing wallpaper. If you wish to change the color of the paint in the future, you will need to take the wallpaper down at this point.